Lifting chalk is used to increase hand grip around barbells, dumbbells, pull-up bars, etc. It comes in the form of solid white bricks that are used to spread powder across the palms and fingers. It increases grip by eliminating sweat and moisture. Chalk is a very popular exercising tool for olympic lifters, gymnasts, Crossfit athletes, and mountain climbers. Lifters sometimes keep a stash of chalk in tupperware containers in their gym bags. 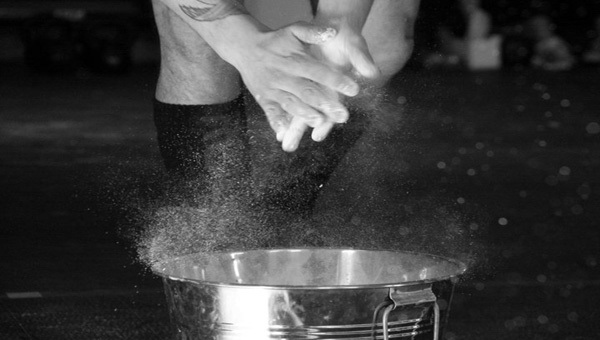 Crossfit gyms sometimes have buckets filled with chalk in various places around the gym for the athletes’ convenience. Most gyms do not have this added perk. You can purchase lifting chalk in some sporting goods stores, or gym equipment suppliers.